This is not a sponsored post. I received a DockATot for review purposes and all opinions are my own. There are affiliate links below, but as always, I only promote brands and products I'm truly passionate about! I want to go on record that if you have one of those babies that is just a magically great sleeper, I can't relate to you at all. We love our sweet Joy to pieces, but sleeping isn't one of her strengths. Needless to say that's made it a smidge hard on Mr. KISS in the Kitchen and I. We've finally got in a good routine with who's on shift and how we split up who stays up with her ALL night (yes, some nights were like that during the first 6 weeks), but we've also relied on some clutch items that help baby girl stay asleep once she gets there. 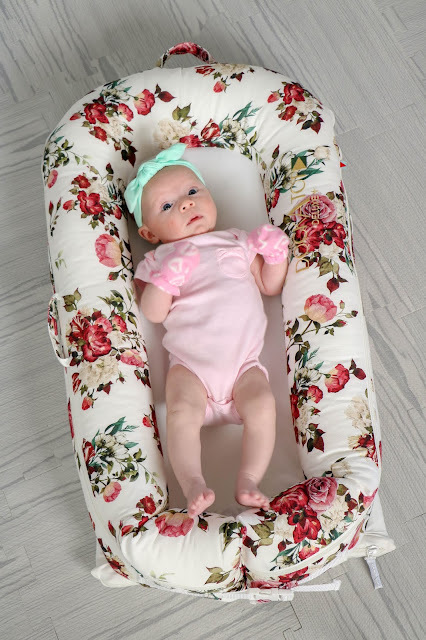 I mentioned a few of the things (The Ollie World swaddle, a childhood sleep consultant and the DockATot) in my newborn essentials post, but I wanted to share more details about the DockATot because it's just that great! I was so excited when her DockATot arrived at the house. I was right at 40 weeks pregnant and thinking maybe her DockATot was what she was waiting for ;). Turns out, it wasn't, and she cooked another 8 days. When we came home from the hospital, she had her comfy lounger awaiting her. The DockATot is a multi-function lounger. Babies can sleep, play and chill in an incredibly comfortable and safe dock that can be easily moved around the house or when traveling! They are created in Sweden and they're truly one of a kind when it comes to a safe lounger that is comfortable, functional, and stylish. Although Miss Joy often has a hard time getting to sleep, she sleeps much harder and longer when she's in her DockATot! If your baby sleeping longer sounds good to you, click the photo below to shop! You can even sign up to save 10%! All DockATots have been tested for breathability, are made from non-toxic materials and feel like a plush cocoon that all parents can feel confident is safely keeping their little one comfortable. In my newborn essentials post, I mentioned the importance of a "fourth trimester". This refers to the first few months of baby's life being as close as possible to their life in the womb. This translates to loud, tight and dark. 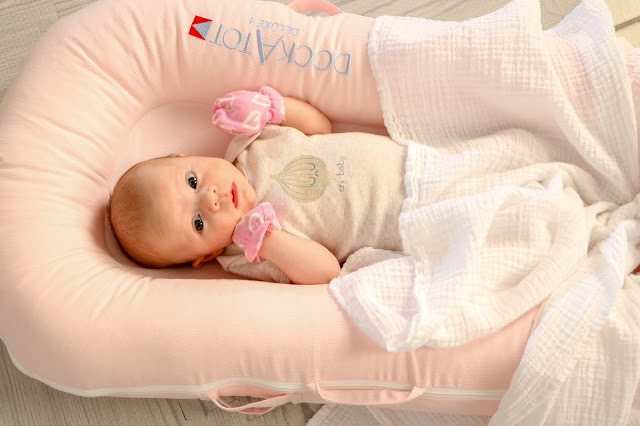 The DockATot is the perfect lounger to help baby still have a womb-like experience that is soft, tender, and snug! Miss Joy loves hers for sleeping, playing and it's also a great place to do tummy time as the rounded sides can go under her arms to prop her up. One of my favorite things about the DockATot is how easy it is to change a cover and add a toy bar. It seems like so many baby items require an unbelievable amount of assembly and what new parent has time for that?! The DockATot comes ready to go and switching out the covers is a breeze. The toy bar takes less than a minute to put in place and is secured through cotton handles on the side of the dock. Thank you, DockATot for making my life easier! Little Miss Joy should fit in this Deluxe DockATot until she's about 8 months or so and then we'll graduate her to the Grand DockATot. I know that time is going to fly by- it's so hard to believe our baby girl is already 2 months old! It's been the fastest yet slowest 2 months of my life and I'm so grateful for this sweet baby God entrusted us to care of! If you want to know more about the DockATot, check out their website! Stay tuned for a post from my intern, Amanda! Y'all have loved her other recipes (especially these Veggie Egg White Muffins!) and she's bringing some roasted veggies your way next week!